Before watching a short video which introduces the Bermuda Triangle, familiarize yourself with the following entries. 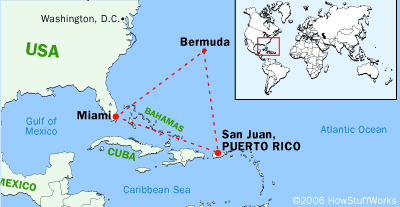 the Bermuda Triangle – the area between Miami, Bermuda and Puerto Rico where a number of aircraft and ships are said to have disappeared under mysterious circumstances. Christopher Columbus - an Italian explorer and navigator who discovered the American continents. describes a situation, usually one that is difficult, dangerous or not familiar (got into the murky waters of jealousy and relationships). Many nouns which are more commonly seen as singular appear as plural in some specific contexts. However, certain nouns are always uncountable. For example, nouns that represent mass or abstract concepts such as air, information, physics. There are also nouns which are found exclusively or almost exclusively in the plural, such as scissors (there are some scissors.) In order to speak of those nouns as singular, we use quantity nouns, for instance, a pair of (there is a pair of scissors). Complete the following sentences by selecting the appropriate forms of the words/nouns which fit the sentence contexts. Consult a dictionary when necessary.